On the 1st October, I learned via MTB-Turku that they were assembling a team for the Mammoth March, an endurance orienteering race, this time to be organized in Southern Finland in the end of October, around a small city of Vihti. New to this years race was also bike divisions. The distances for cycling were 100, 130 and 170 kilometres. The start time was to be 8PM, meaning riding through the night. MTB-Turku "All Night Long" team (Hannu, Matti, Jarkko and Peter) was going to do the longest 170 km, entitled as "Impossible". It didn't take long for me to say yes and join them. This was going to be exciting! The route was published on October 18th. Our team had very good communication and planning via Facebook. Our orienteering man Hannu did fantastic work with others for the maps and planning our options. The Impossible contained 24 checkpoints, and one of them had a swimming task, or running/cycling penalty lap. The end of October usually means wet and fairly cold conditions here in Southern Finland. I was actually hoping for the first signs of winter, because I'm anticipating for a harsh winter here. Well, this hope was surpassed. We had the first snow on Thursday-Friday night, just before the event, and the night temperature was forecasted to be -9°C in Vihti! I wanted to ride with my 9:Zero:7 with the 29er wheels, but the problem was that I don't have studded tires for them. Riding with ordinary tires wasn't a good idea because the roads were icy pretty much everywhere. The help came in the form of Matti Kiijärvi, the grand old man of Turku's recreational cyclists. He happened to have another set of studded 29er tires. Huge thanks Matti, this was crucial! The gear was then sorted out, but I had other problems too. My lead up for the event was difficult, to say the least. I had a knee problem two weeks ago and then I had a flu a week before the race, but fortunately it wasn't serious. But my riding has consisted only daily commuting for the past month. If this wasn't enough, I got some kind of cramp in my lower back on Thursday, and couldn't walk in straight position. On Friday morning, I had real difficulties to get up from the bed. My walking was still like a poor old man. I knew that my back didn't hurt in the riding position, but all this meant that I had a real challenge in my hands. I rode from home to Neste gas station in Paimio to join the team. It was snowing! 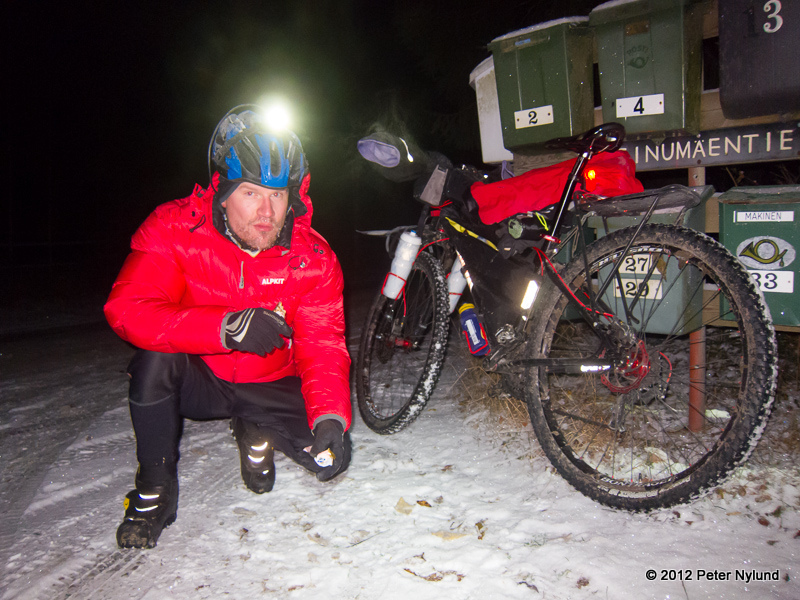 When we arrived in Vihti, I changed only the front tire, as the clock was ticking towards the start. For the first couple of hours, riding didn't feel too bad, but I had a little bit difficulties to keep up with the pace of our team. Obviously my back muscles ate some of the power of my legs. There were couple of nice trail sections in the early part of the route. Water bottles (even my Zefal Arcticas that have some insulation) were freezing fast, and all chocolate and musli bars were like ice sticks. Around midnight, after 4 hours of riding, we were approaching checkpoint 6, the swimming point. At this point I had my first thoughts of quitting. My legs really were somehow out of power. The temperature was -9°C and I decided to not to swim. Fortunately, the organizers had put a heated tent there but I considered that it was too big risk for me because I have plenty of plans for the forthcoming winter. Jarkko, Matti and Peter taking their clothes off. Tough guys! Hannu had already clothes off and tried to put an icy vest on him. That was too much for him too, and he decided to not to swim. I meant that we had to either cycle 17 km or run 3,8 km penalty lap. Cycling 17 km in these frigid conditions would take an hour. Not good. My back was still hurting and running didn't feel like a good idea. Not good. But we decided to run. Now, this turned out to be a great decision! In the beginning, running didn't feel good but as we progressed with Hannu, enjoyed the full moon and chatted, it opened my back muscles. Also, my feet felt nice and warm. As opposed to me, my 9:Zero:7 was working flawlessly. Back on the bikes, and my riding felt much better. A small orienteering mistake at checkpoint 10. We took a little break there. Alpkit Filo down jacket was keeping me warm. (Photo by Peter). We had our best phase at this stage of the race. We rode really well and with a good pace. After this I started to really suffer. I was so sure that I just have to quit, I was literally very close to break down. But, we had a great team, and they encouraged me to push forward. Matti said that I know these bad moments from previous endurance races, and that's true. But this time it felt almost devastating. So, I continued, but I haven't suffered so much EVER. Not even in my 24-hour solos. For the first time, at one point, even my eyes closed briefly but I still kept pedaling. I was literally in the twilight zone. And it was so freakingly cold. I had to put my down jacket on to keep warm, even when I was riding. The sun was rising, and Hannu offered me a little bit different eating. It actually helped me. I got through this very very bad phase. Also, I had CamelBak hydration pack with the frozen tube on my back, but it thawed because it was inside of the down jacket. A very good thing because the water bottles were almost completely frozen. The last six hours were still pretty much the same: lots of hills, suffering, suffering and... yeah, suffering! We visited a grocery shop to buy some cokes and ate some sandwiches. It helped for a while, but the suffering felt like it was never going to end. No matter of the amount of suffering, I was going to ride to the finish with my team. Checkpoint 18 was entitled "X-factor", and included written instructions. That was a nice break from the... suffering. Matti was in good spirits all the time. But, for some reason, all the distances that he said for the remaining checkpoints felt awfully longer. In the last checkpoint, Matti said to me that no-one is bullshitting me now and there is only 3 km to the finish. Well, it didn't matter at this point, I knew that the finish can't be far away. And then it happened. The mind is pretty interesting thing. I rode fairly easily those last kilometres with my team. After almost 18 hours of... suffering, 206 kilometres, reaching the finish line felt unbeliavable, because I was so sure (many times) during the race that I would quit. All the credits goes to our team. I was definitely the weakest link in our team. Without you guys this wouldn't have been possible. You made impossible possible. This was definitely most insane effort for me, but at the same time, it's the reason why I like endurance events. It's about winning yourself. It's mind over matter. It would have been less difficult (not really easier) if my preparation and lead up would have been better. And, an excellent training for things to come... my memory of suffering is strangely short. An excellent report by Peter here, and in Finnish by Jarkko here.